This is not a swear jar, dammit! 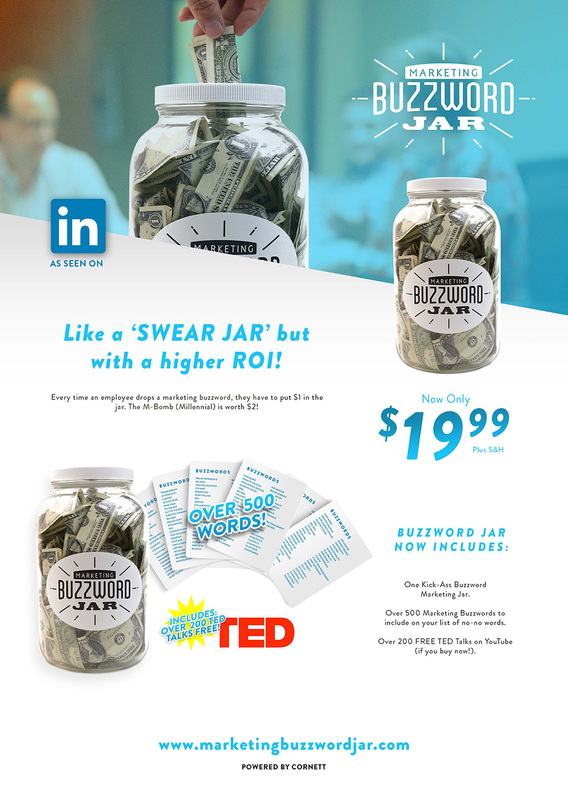 It is, in fact, a "Marketing Buzzword Jar," the latest industry innovation (and silly self-promotion) from Whit Hiler and his goofy gang at Kentucky ad shop Cornett. Perfect for agencies, marketing departments and startups, the item launches next month and will cost $19.99. Employees put $1 in the jar each time one of them utters a hackneyed, overblown marketing word or phrase. You know, stuff like "big data," "influencer" and "scalability." Dropping the M-Bomb—"millennial"—will cost you $2. "The idea for the Marketing Buzzword Jar came from a joke," explains Hiler. "We laughed about how profitable a Marketing Buzzword Jar would be in our agency, and we're all about to laugh again—all the way to the bank." Now, you may well ask, isn't this just an ordinary jar with a gimmicky name and a jacked-up price? Well, Whit Hiler, isn't it? "This particular jar is amazing," he insists. "It's made of glass with a plastic top. We tested over 600 plastic and glass jars before landing on the jar you see in the photos. It's very well designed, and comes with a nice big 'Marketing Buzzword Jar' logo on the front. Agencies should appreciate the design and branding." Awesome! We have it on good authority that McCann has long used a stinky old pickle jar to collect its marketing buzzword cash, while Ogilvy favors a shoebox. So this product should really come in handy on Madison Avenue. Hey, at the very least, eliminating buzzwords should improve intra-agency communications. You might finally be able to understand what the media planners are talking about. 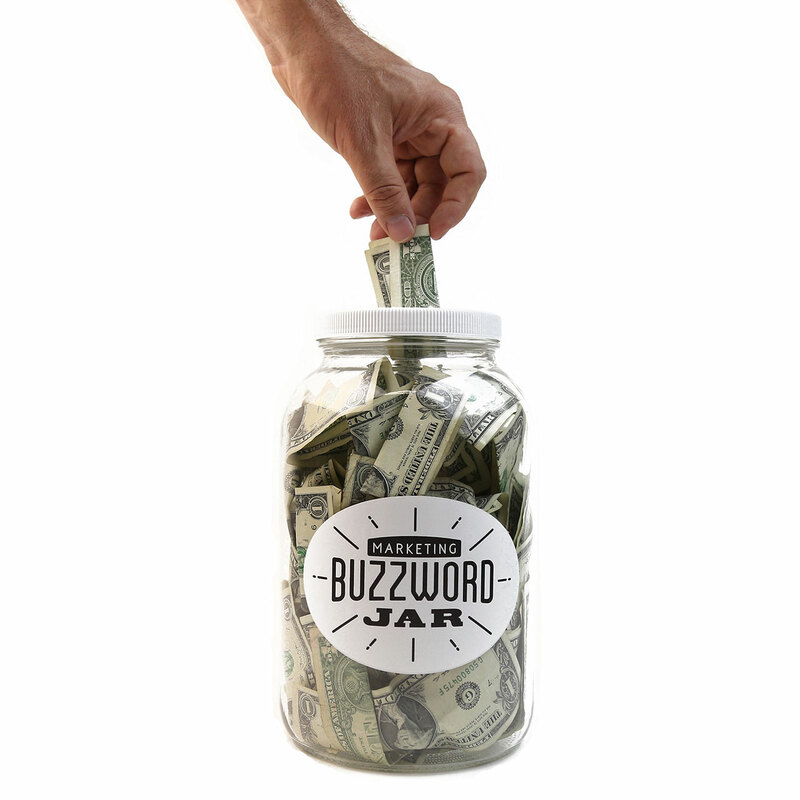 You can fit about 75 to 100 dollar bills in the Buzzword Jar (way more if you wad them up or mash them down with a stick). Proceeds should add up fast, and according to Hiler, the possibilities are endless: "Agencies could spend that money on vintage Russian helicopters, beer for their employees, illegal drugs, vintage Cabbage Patch kids, pitches, Ikea furniture, agency murals, exotic desks, bringing in popular Instagram influencers to speak, a new website, wild animals, art installations, trophies, etc." Um, Whit … "influencer" is a buzzword. Time to feed the jar!